Scenically located in Belding, Michigan, Grattan Raceway is host to a variety of track days and other events for cars and motorcycles alike. As an added bonus, the facility also includes a motocross track for the dirt-inclined. Although the circuit is on the small side, it features a challenging array of corners with elevation changes throughout. 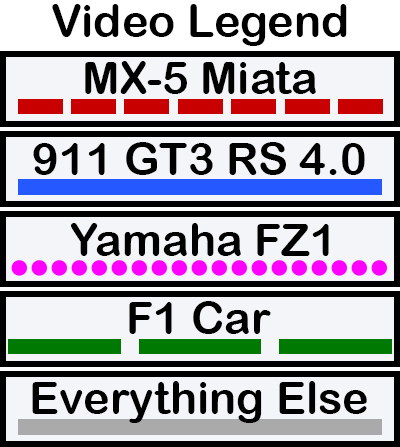 The racing line at Grattan Raceway is very similar for the three basic vehicle types. The motorcycle actually runs an almost identical (slightly faster) lap time when taking the Porsche's line, but the reverse doesn't seem to be the case. The Miata takes a wider line in a couple places, carrying slightly more speed at the apexes, particularly in Turns 1, 8, and 10. This course includes several connected right and left hand corners, and the line in between apexes requires careful attention. Starting with Turn 2, each vehicle runs all the way out on the exit, only getting back to about mid-track before turning in for 3. Exiting Turn 3 you stick to the inside to set up for Turn 4 in every vehicle. In the 5-6-7-8 series, it seems best to drive from one apex to center track to the next apex. The exception is the Miata, which sticks the inside at the Turn 7 exit in order to carry as much speed as possible through Turns 8 and 9. This approach doesn't create an advantage for higher power vehicles because they have to lift or even brake in Turn 9. With that in mind, they hold a tight line through Turn 8 - actually taking a slight double-apex - in contrast to the Miata's wide, sweeping groove. These hot laps in an S2000 follow the recommended line pretty closely, particularly the strategies Al implements in Turns 2-4 and 5-9. One mistake I think this driver makes is not getting to the outside early enough while setting up for Turn 10. Since he/she is still driving toward the outside immediately before turn in, it takes extra time and energy to get the vehicle pointed toward the apex. Decent lines here, but I noticed two issues: the driver sticks to the left hand side of the track leading up to Turn 3, when he/she should be about mid-track. As in the previous video, the driver makes a similar mistake entering Turn 10. Ideally, the vehicle (except for the motorcycle) should be close to the outside of the track, running parallel to the track prior to turn-in for 10. Instead, the pilot is driving toward the outside of the track immediately before turning in. This is not optimal. There are videos of fast riders at this track, you just gotta find them. I'm not sure what jetbdude (this video is not from his channel) is riding, but I'm guessing it's a 1000. The only significant strategic error I see him making is failing to ride all the way to the exit of Turn 2. Instead, he goes out to about mid-track, then sets up very wide for Turn 3, taking a late apex. The only reason to do this is to invest in exit speed, which provides no advantage in this case, as Turn 4 requires lifting off the throttle almost entirely. Furthermore, this line is physically slower around the corner, and leaves you open to a pass on the inside. Not to take anything away from this ride, which is a romp no matter what. This doesn't look to be as experienced a rider as in the previous video, but this clip provides a good feel for the track at a more average motorcycle pace. These guys are riding pretty hard. The footage isn't the best, and there's music drowning out the sound of the bikes, but I think it can still be helpful. Notice the rider tracks to the outside when exiting Turn 2, then sets up around mid-track before staying close to the inside through Turn 3. This is Al's recommended approach. Those first two videos were really just a warm-up. This one's the real deal. You'll notice that although the driver is still more concerned than necessary with cutting off distance at the kink leading up to Turn 10, the vehicle is pointing parallel to the track before turning in for 10. I also thought he may be turning in a bit early for 5, but it's hard to tell. A lap record was set in this qualifying session, so I guess they don't call him Jesus for nothin'!